These garments aren't "archaeological" in a technical sense. They were preserved as part of the coronation regalia of the Holy Roman Emperors and are associated with a variety of emperors over several centuries. Some of these garments are familiar from many publications while others are more obscure. I'll add a bibliography at some future date. My emperor wears a composite of garments associated with several different historic individuals. 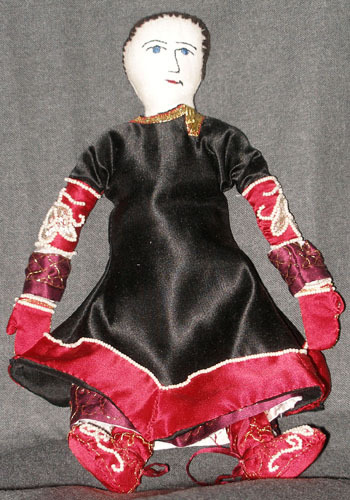 Innermost, he wears a silk alb with purple embroidered bands at the cuffs and hem (and neck, but you can't see it). The cut of the garment is conjectural as the bands are all that survive from the original, although they have been re-mounted on reconstructed garments at several points in history. Over this, he wears a black silk dalmatic with an offset neck opening. 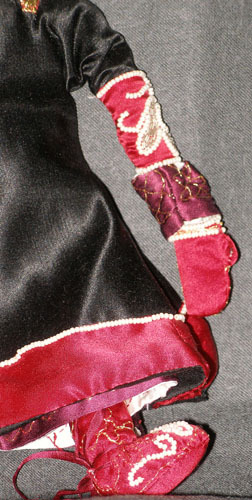 The cuffs of this garment are most likely to be familiar as they are featured in many books on embroidery. They have a leaf-shaped design outlined in pearls and filled in with small gold tubular beads. 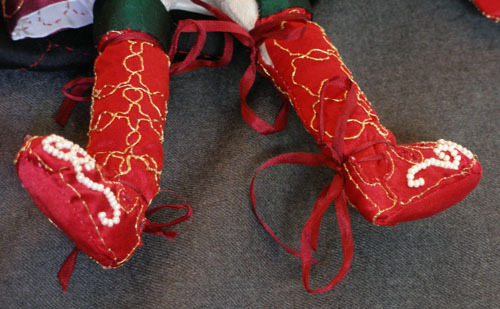 On his legs, the emperor wears knee-high embroidered silk leggings. The shoes are also embroidered silk, decorated with pearls. He also wears silk gloves, again embroidered and decorated with pearls. Later he will have a crown, with a silk cap underneath, as well as a fancy belt. 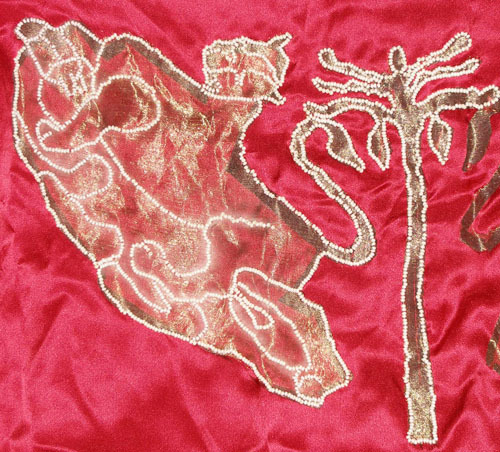 At the bottom of this page, you can see some in-progress pictures of his ceremonial cloak, made of red silk embroidered with golden figures of a lion attacking a camel, outlined in pearls. 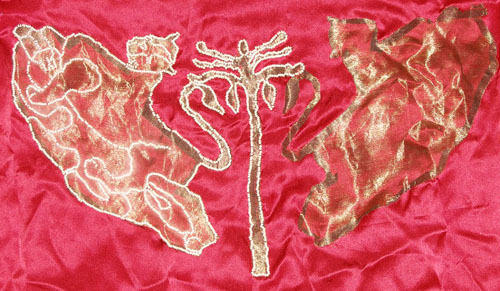 In-progress pictures of the "lion cloak".